You likely have seen more and more fixtures, ducts and lighting being supported with braided wire cable on the job. Products like the Erico/Caddy Speed Link and the Gripple have added a versatile option in many applications. 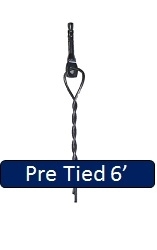 Arlington Industries has added their version of a braided wire hanger, the Wire Grabber System. The key component to any of the systems is the clamp that actually locks on the cable. The clamp on the Arlington is part# FLG3 and is not only available in kit form but also separately allowing you to purchase bulk cable and create your hangers on the fly. It is easy to use with a thumb screw for a quick set and adjustment followed by a quick lock down with your screwdriver or pliers. NO SPECIAL TOOLS REQUIRED. The Arlington Wire Grabber is available in several kit types. A straight version with a loop on one end and straight cable and FLG3 clamp is available in lengths up to 30′. There are so many things you could support with this kit, anything from duct work, cable runs with j hooks, signage and more. A 10′ length kit with a toggle attached and straight wire plus the FLG3 clamp is available designed for suspending light fixtures. A “Y” kit is also available as well. One thing that make the Arlington Wire Grabber system appealing over the other brands starts with cost, not only in the basic kit pricing but in the ability to purchase the wire grabber clamp outside a kit (we offer them in packs of 10 on our site) and buy your cable in bulk. While kits have their advantage if you are doing a standard install over and over again for instance, but buying clamps and bulk cable allows you to create what you need as you need it with no waste. The kits come with a .080 gauge braided cable that will provide a 75lb load in static situations. If you have never used this type of hanger, grab a couple kits and give them a try. If you have been using comparable systems you may be able to save your self some money especially with the bulk cable option. We have had extension poles for various powder tools including Hilti, Ramset, Simpson, Powers and more and now we have an extension for the Hilti DX460, the new Hilti DX2, the Ramset XT540 and a variety of gas tools. The LS460-6 pole turns any of these guns into an overhead tool. The extension pole offers not only improved productivity and lower labor costs but increased safety. Made in the USA from dielectric material meeting OSHA standards. If you have a Hilti DX460 or Hilti DX2 tool, you will find this tool well worth it’s price, right arount $200. Also works as an extension pole for the Ramset XT540, and the Simpson PTP-27s tools. The extension will also work with a variety of gas tools from Ramset, Simpon and Powers. Click to see a compatibility chart. New Purlin Master Install Tool Installs & Grid Wire! This really is an innovation in installation of bar joist clips and purlin clips. The Purlin Master will not only install the clip for you, but it will also tie the wire on to the clip all while standing on the floor. Check out the video, it really is a slick system. The Purlin Master saves you time and money in several ways. First off you aren’t paying someone else to tie the wire for you. Shipping clips is cheap, shipping grid wire or pre tied clips, not so much! With the Purlin Master, you buy the clips and source you grid wire locally. You no longer have to stock several different sizes of ceiling grid wire, or worse yet cut off extra. 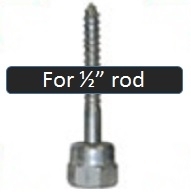 The Purlin Master requires use of the proprietary clips, the ADOC14 for use on Z purlin or the VOH14 for bar joists. Make sure you take a moment and watch the video and you will see this tool is a must have if your are suspending grid wire from z purlin or bar joists. The Ramset Viper ceiling tool has become the tool of choice for not only ceiling contractors but for electricians and limited voltage contractors or anyone who wants to suspend grid wire, pencil rod, jack chain or even 1/4″ rod from the ceiling. To date, the Ramset Viper tool has had 3 major versions. Below is a brief description of each model. Original Ramset Viper Tool. The original Viper tool was of a metal body construction and had a manual advance system, similar to what you will find in the Powers Sniper Tool. The tool was light weight and really bullet proof provided that you kept it clean. There are still a fair number of these on the job, parts are all but gone. The tool worked on either a fixed or telescopic extension pole. Ramset Viper 3. The Ramset Viper 3 tool added a few really nice features including automatic load advance and was designed to operate with less cleaning and maintenance. Being a more complicated tool with more moving parts, repairs did increase a little but again really was a solid tool for day to day use. The tool used the same extension pole system as the original Viper tool. Parts are still readily available as the tool has only been out of production for a few years. Ramset Viper 4. The Ramset Viper 4 is the latest version of the Viper tool and has some significant changes. Most note worthy on the tool is the fact that it uses a proprietary pole system for added safety. You need to make contact with the ceiling and then push up on the outer trigger pole to actuate the tool. There is a base pole portion that has the trigger sleeve, available in 3′, 6′ and 8′ sections and then you can add as many 3′ extensions as you choose. The 6′ base is the most common all though I like the 3′ base and a 3′ extension, it just makes it easier to lock up in the gang box. The tool shares some parts with the Viper 3, the piston, buffer, return pawls and the load indexer ball and springs. So far other than a few pole issues in the first tools to hit the street, the tool has been very reliable. The biggest problem we have seen is making sure everyone understands the pole tool is not interchangeable with other Ramset Viper Models. Ramset has been making quality powder actuated tools for years. The Viper tool quickly became a favorite tool of anyone doing overhead fastening. Whether hanging ceiling wires, light fixtures or data cable runs, the Viper tool is designed specifically for shooting to the ceiling. The earliest version was a very simple tool that required manual advance. The tool was a real work horse but it required daily cleaning. The latest version, the Ramset Viper 4 is a great tool for overhead fastening. The tool offers automatic advance and a unique pole system that is stable and expandable from 3′ to the moon just by adding extension segments. The Viper 4 tool has the added safety feature of a separate sleeve for activation making it safer than other contact tools. You can’t just lean on the tool by mistake and set it off, it must be in contact with the ceiling, and both hands on the pole. I would add an important point on the Ramset Viper 4 tool: POLES ARE NOT INTERCHANGEABLE WITH PREVIOUS MODELS! We are finding that many online marketers not only don’t understand the tools, but don’t understand the importance of the right extension for the tool. 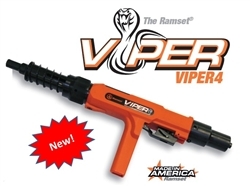 If you have any questions on the Ramset Viper 4, visit our store online at ConstructionFastening.Net or call us toll free at 1-877-212-2377.